The General Secretariat of the Council of Ministers and the Committee for the Investigation of the Obstacles to the Completion of Investment Projects from Some Government Entities composed of Diwani Decree No. 6 of 2017 sponsored a workshop for public inspectors in ministries based on the recommendations of the Committee. As well as reducing the intersection of government procedures and avoid overlap in the work on investment projects between the relevant authorities. The meeting was chaired by Dr. Turahan appearance of the Mufti, head of the Secretariat of the Coordinating High Commission between the provinces, which pointed out that the Committee has been formed for nearly two years has succeeded in resolving nearly 40% of the projects lagging, and took 30% of them way to resolve, while remaining 30% Under review and audit, and part of which is before the judiciary. 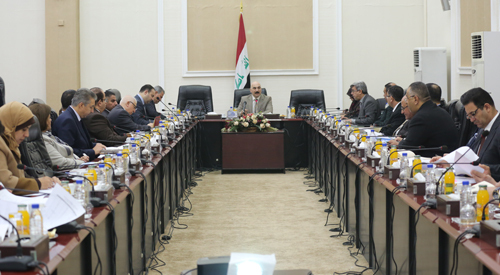 The meeting included a presentation of the achievements of the Committee as well as the observations of the inspectors of the Ministries of Finance, Construction and Housing, as well as the Secretariat of Baghdad. On the other hand, the National Investment Commission and the State Real Estate Service addressed the most important obstacles facing their work in the investment file. At the end of the meeting, the attendees listened to the interventions of the general inspectors of the concerned ministries, their interventions, observations and proposals to promote this vital and important sector. The participants stressed the need for cooperation and coordination in order to remove obstacles to serve the national economy.